OspreyWatch is a global community of observers focused on breeding osprey. 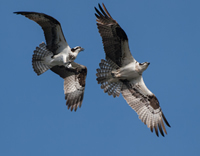 The observers are linked by an interest in osprey, concern for the health of aquatic environments, and data submitted to a repository through the OspreyWatch website. The mission of OspreyWatch is to collect information on a large enough spatial scale to be useful in addressing three of the most pressing issues facing aquatic ecosystems including global climate change, depletion of fish stocks, and environmental contaminants. Osprey are one of very few truly global sentinels for aquatic health. They feed almost exclusively on live fish throughout their entire life cycle. They are a top consumer within aquatic ecosystems and are very sensitive to both overfishing and environmental contaminants. Nearly all populations breed in the northern latitudes and winter in the southern latitudes, effectively linking the aquatic health of the hemispheres. Their breeding season in the north is highly seasonal making them an effective barometer of climate change. Climate is an integral part of an ecosystem and species have adapted to their regional climate over time. Ongoing changes in climate that have followed the industrial revolution threaten the continued existence of many species and represent one of the greatest challenges faced by conservation biologists in the coming decades. Although an established suite of physical indicators are being used to track changes in climate itself, how these changes influence the complex interactions between species and their environment remains poorly understood and very difficult to predict. Monitoring programs that track the response of species to changes in seasonality on large spatial and temporal scales are very much needed. Osprey nest throughout northern latitudes and migrate to the southern hemisphere to winter. Their breeding/winter ranges and annual cycle are finely tuned to climate, making them an ideal model for investigating climate-related shifts in ecology. Fish account for 20% of the protein consumed by people around the world and the fishing industry is an important source of employment. Fish are a particularly important commodity for cultures within the developing world. 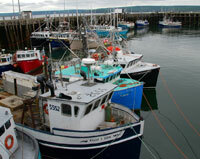 However, the growing global demand for wild-caught fish is altering the balance of aquatic ecosystems. Over the past century, many of the world’s great fisheries have been depleted or are experiencing harvest pressures that are beyond sustainable limits. The consequence of overharvesting fish on non-human consumer communities is poorly understood. Osprey are top predators within many aquatic ecosystems around the world and are fish specialists. Because their reproduction is tied directly to fish stocks, they represent an ideal model for broad-scale monitoring of fisheries health. In an increasingly industrialized society, a wide variety of contaminants are released into the environment every day from residential, commercial, and industrial sources. On a global scale, the production and concentration of various compounds changes with commodity demands and new contaminants are being developed and distributed daily. 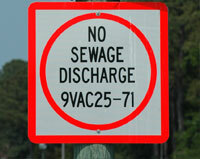 Some of these compounds have the potential to have a negative impact on human and/or environmental health. Birds that are high in the food chain have been used for decades as early warning sentinels for environmental contaminants. The osprey has been determined to be one of the most effective species for monitoring contaminants in aquatic systems on a global scale. OspreyWatch is made possible by the great open source projects Ruby on Rails and WordPress. Map visualizations are made possible by CartoDB. Application development is provided by Solertium. 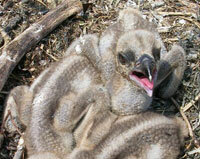 Volunteers, non-profits, and government agencies collect and contribute data to the OspreyWatch Program. We ask that publications derived from this data or website be cleared with CCB and it’s conservation partners before publication. Read the detailed agreement.